The stars were primped to perfection on the red carpet during yesterday’s Golden Globes ceremony. From bright and bold to demure and sophisticated, here’s a look at the fashion highlights from the night. Lena Dunham is probably wearing the sexiest dress of her career in this smokin’ yellow number. She looks ultra-glamorous with her nod to classic movie-star chic. Sarah Hyland also brought some colour to the red carpet and looked pretty in pink, while Caitlin Fitzgerald looked gorgeous in baby blue. Rocsi Diaz, Naomi Watts and Robin Wright were all on the same page when they chose their gowns for the Globes, opting for iridescent halter dresses in an understated champagne hue. Just, wow. Emma Watson looks immaculate in her dress-pant hybrid ensemble courtesy of Christian Dior, while Lupita Nyong’o looked effortless and beautiful in this stunning gown from Ralph Lauren’s spring 2014 collection. Drew Barrymore, Olivia Wilde and Kerry Washington all looked stunning and radiant as they opted for both figure-hugging and loose-fitting gowns on the red carpet. Now, who are the stars everyone is going to be talking about because of their risque fashion choices? Probably Julia Roberts, Maria Menounos, Sandra Bullock and Zoe Saldana in these bold ensembles. Cate Blanchett had one of the best looks on the night in this Prabal Gurung gown, while Emma Roberts looks oh so elegant in her sleek ensemble paired with chandelier earrings. Rocking a different look to what we usually see from the star, Sofia Vergara wore a black ball gown with ruffles and a soft blue necklace to grab our attention. 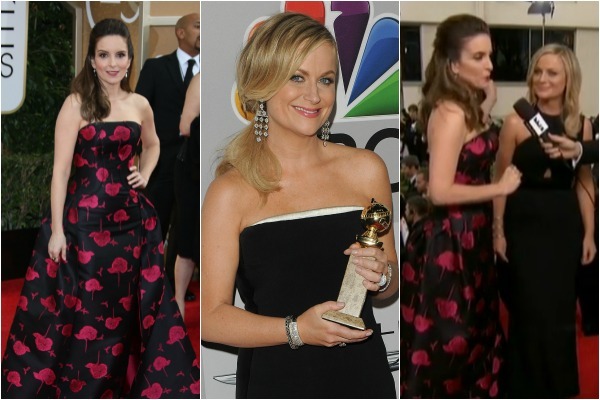 And then we’ve got the hosts, Tina Fey and Amy Poehler, who looked absolutely perfect in Carolina Herrera and Stella McCartney. Which were your favourite fashion picks from the Golden Globes red carpet?